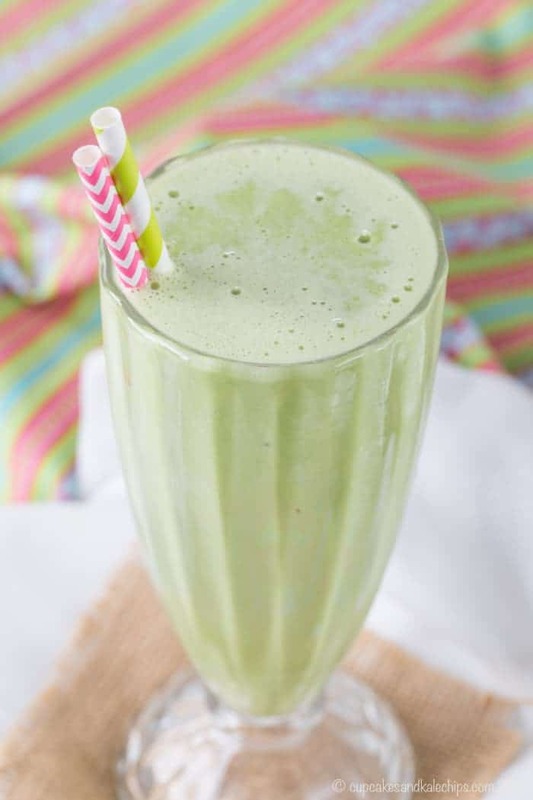 This St. Patrick's Day Green Smoothie lets you have a Shamrock Shake the healthy way! 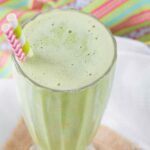 Healthy Shamrock Shake Mint Smoothie satisfies your minty milkshake craving the healthy and guilt-free way with a naturally green smoothie. 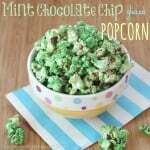 All of the minty flavor and creamy texture you love, but none of the extra sugar and calories! Plus there are no artificial colors or ingredients. 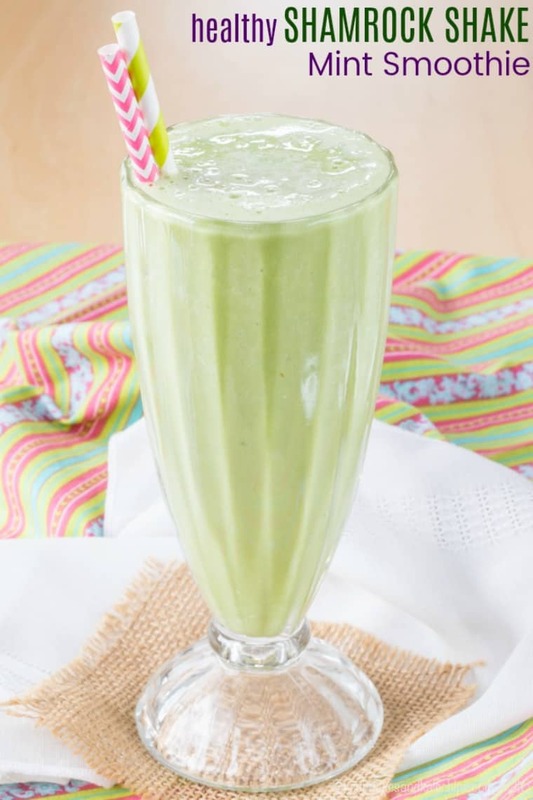 This Shamrock Shake Smoothie recipe is a fun part of a gluten free St. Patrick’s Day menu! I have been dying to get myself a Shamrock Shake from McDonald’s. But then I remember that the last time I had one, I wasn’t thrilled. I rarely indulge in a McDonald’s milkshake, but I don’t think they have been the same since they started putting whipped cream and a cherry on top. I mean, this is McDonald’s, not an ice cream parlor, or even a diner. Their food isn’t supposed to come with garnish. Then I saw someone post the list of what is in a Shamrock Shake. Not that I don’t ever consume those ingredients – I do love McDonald’s plain old vanilla ice cream from time to time. And the ice cream is the main component of the shake. But it wasn’t worth the calories or chemicals for something I don’t really like. But on St. Patrick’s Day, for some reason the idea of a Shamrock Shake for breakfast seems like the way to celebrate. And then after Easy Slow Cooker Corned Beef or Easy Shepherd’s Pie for dinner, why not have another one for dessert?! 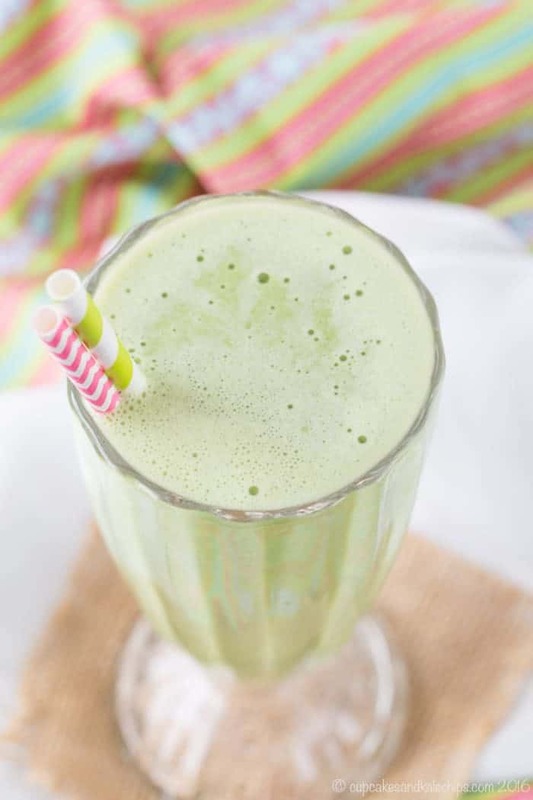 This healthy Shamrock Shake smoothie will totally satisfy your craving for that minty milkshake. 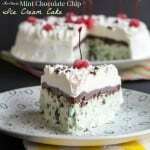 It’s sweet and creamy, and, in my opinion, perfectly minty. Honestly, I am not a huge mint person, so this is admittedly a little light on the mint. If you like things really minty, go ahead and add more mint extract. And no, you can’t taste the spinach or kale, and if you blend it up, you don’t even know it is there, other than the lovely green color it gives the smoothie. Make sure you have a banana in your freezer. Break it into chunks and throw it in the freezer at night for a breakfast smoothie. Or if you forgot at night, freeze it in the morning so you can have one as a healthy dessert. Add spinach or kale, milk, Greek yogurt or cottage cheese, frozen banana, mint extract, vanilla extract, and ice to your blender. Then all you have to do is blend until smooth. You can also adjust the sweetness if needed with your desired sweetener. McDonald’s does not promote any of their food products as gluten free. However, Shamrock Shakes do not have any gluten-containing ingredients. And the risk of cross-contamination is fairly low. But if you want to be 100% sure, your best bet is to make it a home. 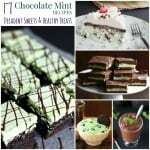 What other mint recipes can you make? 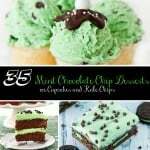 And if that’s not enough, check out 17 Chocolate Mint Recipes and 35 Mint Chocolate Chip Dessert Recipes! With natural, real ingredients, this Shamrock Shake smoothie is definitely healthy enough to be breakfast-worthy. But it’s definitely still sweet and yummy enough for dessert. And that’s without any added sugar, or even any green food coloring, for that matter. 4 ice cubes I used 4 regular-sized ones. This was probably about 3/4 cup. Adjust accordingly based on the size of your ice cubes and how icy you want it. Put all ingredients into a blender in the order listed, and blend until smooth. Enjoy! Originally published on March 17, 2012. Photos updated on March 3, 2016. This is a very interesting recipe indeed, thanks for sharing Brianna! One thing I’ve been doing lately is blending avocado seeds, they’re a great source of antioxidants and fiber. So whenever I eat an avocado, I keep the seed for later and just add it as an extra ingredient to my next green smoothie. If there’s enough fresh fruit in there, you can hardly taste the avocado seed. Worth a try! I’m not sure what exactly I did wrong but mine tasted like banana flavored tooth paste???? This was a great idea to get the kids in my family to eat their greens without them knowing. SO MUCH BETTER than all that gunk that’s in the Mickey D’s shake! This looks much tastier! I have a hard time getting my family to eat enough greens but I’m pretty sure this recipe will help solve that. I really need to keep some mint extract in the house.. I want if just a couple mint leaves though would give it the same flavor? hmmm, must go experiment, since I don’t feel like shopping today, lol. I bet it would work!! I made this smoothie for breakfast this morning, and it is sooo good! 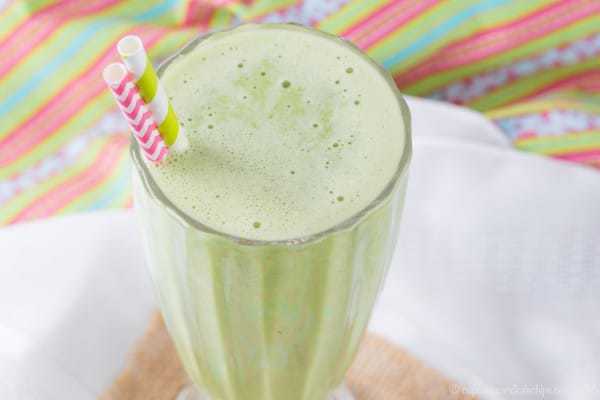 I was a little skeptical at first, because I wasn’t sure how all those ingredients could taste remotely like a shamrock shake, but I was pleasantly surprised! I didn’t have any mint extract on hand, but I did have peppermint coffee syrup. I used about 2-3 TB of that, it was delectable! I also upped the banana to 1 1/2 to make it a little creamier and used spinach for the green and vanilla almond milk. This is definitely a smoothie I will be making again! Thank you for the delicious recipe! So glad you tweaked it to make it your own! Thanks Becca! Green smoothies passing themselves off as shakes is never a bad thing! If I’m doing a low-carb, very low-sugar meal plan, would you suggest an alternative to the banana? I know that helps with the consistency, but I am only eating berries, lemons, and limes for fruit. Thanks! It looks delicious! Hmmm, the banana gives the texture and sweetness. Perhaps avocado and some stevia or other sweetener? Would substituting the mint extract for mint leaves yield the same results? I would think so, though I haven’t tried it, so you might have to experiment with the amount. Thank you, and thanks for checking it out. I am in the midst of a big re-design, so hopefully you’ll check back and see lots of good changes. This looks way better than anything at McDonald’s! Thanks for linking up at my blog hop 🙂 Pinned! Thanks. So happy I found your blog and blog hop. This shamrock shake version is definitely more my speed than McD’s…..not to say I wouldn’t probably enjoy the “real” (but really artificial!) thing, but that ingredient list does burn me a little…. OMG – my St Paddys day post is exactly the same!! Well… slight variation on the green smoothie (coconut milk!!) but same basic theme. How funny!!! (although I have yet to post SO please please know there was no copying involved 🙂 ). Happy ST Paddys day to you and Bug! No worries! There seem to be a million variations on this theme floating around out there this week 🙂 Hope you have something fun planned!